No matter what your needs, Newcastle Apartments features a floor plan to meet them. Our spacious apartments and townhomes range from 625 square feet to 1,112 square feet and feature all the amenities you need to settle in and get comfortable. Take advantage of your spacious Newcastle apartment by hosting a dinner party featuring a gourmet masterpiece cooked in your kitchen complete with elegant oak cabinetry. 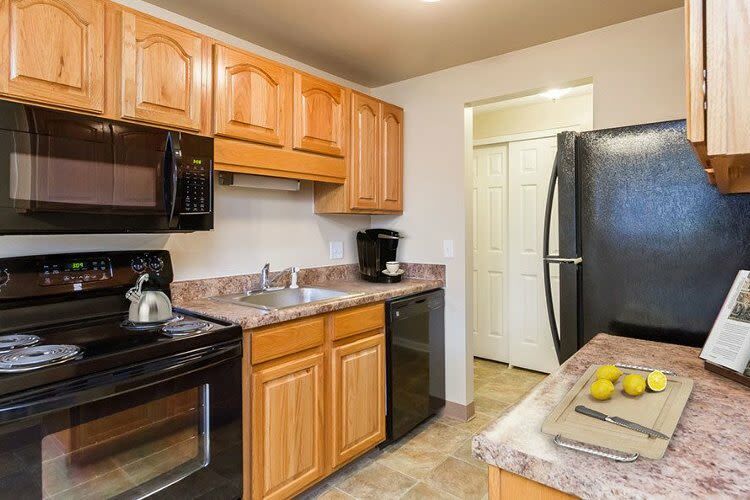 Your new apartment home comes with the finest conveniences as well, including central air conditioning, dishwasher, and garbage disposal. The ample living space awaiting you in your new Newcastle apartment grants you the freedom to place all of your furniture just how you like it, while still having room to roam. Walk-in closets and extra storage in select homes give you a place to store your seasonal sports equipment or winter wardrobe. This is easy, comfortable living at its best. Call today to schedule a personalized tour of your favorite Newcastle floor plans.